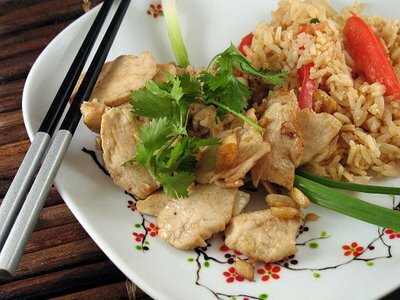 This entry was posted on Sunday, December 9th, 2007 at 10:04 pm	and is filed under Main Dishes, Thai. You can follow any responses to this entry through the RSS 2.0 feed. You can leave a response, or trackback from your own site. So simple, but full of flavour. Probably the garlic that made it so hot. The first time I realized how spicy garlic really is was in Greece, where I ate a skordalia made of potato pounded with olive oil and an entire head of garlic. I thought my mouth was going to explode! Made this for some friends from taiwan. They loved it. Added a stalk of lemongrass.